John the Baptist had a few buddies complain that Jesus was baptizing people on the other side of the Jordan River. I can only imagine the commiserating going on between John’s followers. Jesus was honing in on their territory. He was taking the attention away from his cousin John. Maybe they weren’t invited to as many dinners, or maybe they had lost their favorite spot along the river. Perhaps it was that they weren’t the first ones being asked the difficult questions anymore. Whatever it was I think that it comes down to one basic thing; they were no long everyone’s first choice. John’s response is what we would hope every great leader’s response to be. He expresses great joy in the fact that he worked himself out of a job.He tried to explain it to his followers. There are some jobs that requires one person to set the other person up for success. God called him to prepare the way for the Messiah. John did that, and now it was time to step down. It was time for John to release. Within the church we don’t always do a good job in the hand off. We aren’t always told why positions change. It may cause us to doubt our calling in the first place. We question our relevancy. We doubt our worth. It sets us up for a poor transition where we may not rejoice when we hear our replacement coming. At times over the last 20 years of ministry I have allowed my value get wrapped up in my work. There was one particular section of time in my life where I was put in a position of authority that I had longed for. I loved it everything about that season. After about two years, things started to shift. I had less authority as the leadership above me changed. I didn’t understand why, and no one was giving me any input when I asked for it. I found that I didn’t sleep well at night because I kept rehashing conversation after conversation and asking God what I had done wrong. I assumed things. I stopped living out Philippians 4:8-9, 8 “…whatever is true, whatever is honorable, whatever is right, whatever is pure, whatever is lovely, whatever is of good repute, if there is any excellence and if anything worthy of praise, dwell on these things. 9 The things you have learned and received and heard and seen in me, practice these things, and the God of peace will be with you.” I finally pulled it together after I just let everything go. Every dream, every hope, every desire I had I just put on an “altar” before the LORD. I stopped asking why I wasn’t allowed to serve as before. I started asking God how He wanted me to serve. From time to time I still deal with the pain in the loss of that ministry. I miss the people who I worked. I long for another season to serve in that way. I believe that God will have another opportunity for me. It’s all in His time. I believe that my work now is all about the word “know.” I must dig deeper into God’s word and allow for times of quiet so that I will hear God. I must come to know God in away that I never have before. 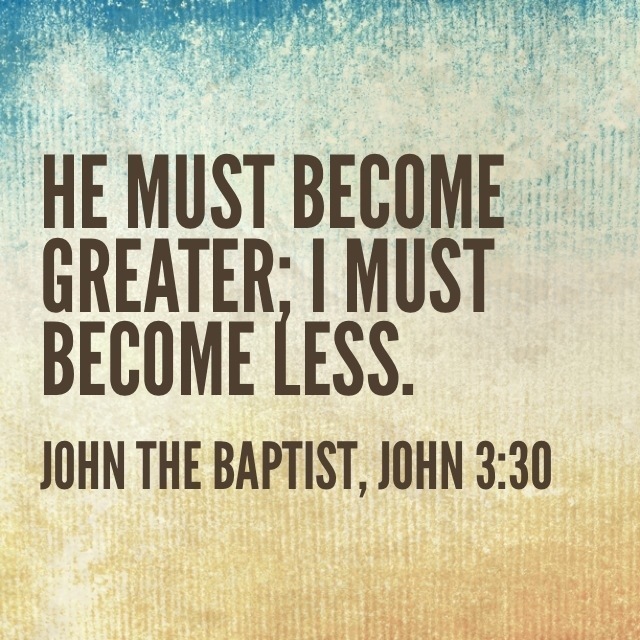 In that process I allow Christ to become greater by understanding my position as a child of God. Amy, Thank you so much for your post. I think we all do this. I appreciate your willingness to share especially the part about letting go and asking God what he wants instead of trying to hang onto something. I have just now come to the point where I have been able to say the same. God Bless. Jean, I would love to hear more about this journey you’ve been on. May God bless you and your precious family.